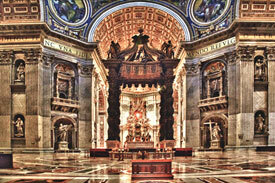 For over 1500 years the pope in Rome has claimed authority over the entire Christian church. That claim has been a source of controversy and division. Is Jesus responsible for the division? been a source of division among Christians. When Josef Ratzinger was elected Pope Benedict XVI in 2005, Germans joked that his selection as pope was proof that God had finally forgiven the German people for having produced Martin Luther and the Lutheran church. The reference to the schism that occurred in the Roman Catholic church in the 16th century as a result of Luther's influence is a narrow view concerning church schisms. In reality schisms occurred within the Catholic church for centuries prior to Luther having nailed his 95 theses to the door of a church in Wittenberg, Germany. One of those earlier schisms separated the Roman church from the Eastern Orthodox Church. Talks between the Roman Catholic and the Eastern Orthodox churches have been ongoing for over 30 years as part of the ecumenical movement. With over one billion and 300 million members respectively, these two churches comprise a majority of today's professing Christians. Upon assuming his office six years ago, Pope Benedict XVI voiced support for continuing the theological dialogue between his church and the Eastern Orthodox Church. However, in 2009 the "rapprochement" between the two denominations seemed to reach an impasse. At their meeting in Cyprus in 2009 and last year in Vienna theologians from both sides were unable to agree on one aspect of doctrine. Which doctrine was it? The doctrine that Pope Paul VI once called a "stumbling block" for church unity: the position of the papacy in the church. The Roman pope's claim to be the leader of the Christian church is not only a stumbling block for the ecumenical process between Catholics and the Eastern Orthodox Church. It is the main topic of dissension in all ecumenical dialogue between the Roman Catholic church and other denominations. Another example would be the Lutheran church, which disagrees with Catholics "on whether papal primacy is necessary for the church or just represents a possible function." The Lutheran viewpoint is that the office of the pope is not part of the basic composition of the church ("Das Evangelium und die Kirche," No. 67, Dokumente wachsender Übereinstimmung. Sämtliche Berichte und Konsenstexte interkonfessioneller Gespräche auf Weltebene, Vol. I, 1931-1982, H. Meyer, editor, Paderborn, 1991; our translation). Rome's viewpoint on the papacy was confirmed in July 2007 in a Vatican document titled "Responses to Some Questions Regarding Certain Aspects of the Doctrine of the Church." The paper restated the Vatican position that the Roman Catholic Church is the only church with a continuous apostolic succession dating back to Jesus Christ and the apostle Peter. Therefore, the Roman Catholic Church is the only true church established by Jesus. The 2007 statement repeated the Vatican's controversial claims made in a doctrinal paper published eleven years ago, "Dominus Iesus." Pope Benedict's position is that apostolic-papal succession is an important key to identifying the true church. A Roman Catholic "sister church" is therefore a denomination that can trace its roots back to Peter as the supposed first pope, but is currently separated from the Roman Catholic Church as a result of an earlier schism. In the Vatican's view, one church in this category would be the Eastern Orthodox Church. The statement released in July 2007 clarifies another aspect of the Second Vatican Council: For the Catholic Church, the word ecumenical means movement on the part of the others. There won't be a restoration of Christian denominational unity with Catholics and other denominations meeting halfway. Instead, if there is to be unity, non-Catholics will meet the Vatican on its terms by recognizing papal authority. According to the Vatican, by not recognizing the pope "these venerable Christian communities lack something in their condition as particular churches" ("Responses to Some Questions Regarding Certain Aspects of the Doctrine of the Church"). Papal primacy will continue to be a stumbling block in the ecumenical process. The Roman-Catholic claim of church-wide authority for the pope is based on the belief that the apostle Peter was the first bishop of Rome and that Jesus appointed Peter to be human leader of the New Testament church. Was Peter really the first bishop of Rome? According to Roman Catholic tradition, the apostle Peter went to Rome about ten years after Jesus was crucified and preached the gospel in Rome for many years. "It is an indisputably established historical fact that St. Peter laboured in Rome during the last portion of his life, and there ended his earthly course by martyrdom" (Catholic Encyclopedia, keyword "St. Peter, Prince of the Apostles"). Whether Peter was really the first bishop of Rome is therefor a fundamental issue for the Roman Catholic church's claim to papal authority. However, even Catholic sources admit that the details of Peter's supposed stay in Rome are unclear: "As to the duration of his Apostolic activity in the Roman capital, the continuity or otherwise of his residence there, the details and success of his labours, and the chronology of his arrival and death, all these questions are uncertain, and can be solved only on hypotheses more or less well-founded" (ibid.). In the Bible commentary Lexikon zur Bibel, German editor Fritz Rienecker writes: "There is no evidence for the viewpoint that Peter was the 'Bishop of Rome' for 25 years" (R. Brockhaus Verlag, Wuppertal, 1977, keyword "Peter"; our emphasis and translation). More importantly, what does the Bible say? Does the Bible indicate that Peter was in Rome from 41 to 66 AD? Quite the opposite – the Bible offers no support for the Catholic assertion. • The Jerusalem conference (Acts 15) took place in 49 AD Peter was among the "apostles and elders" who were to decide the issue of circumcision for Gentile Christians (verse 2). Peter was not in Rome at this time. • Some time after the Jerusalem conference Peter visited Paul in Antioch (Galatians 2:11). He was not in Rome, although he was already supposed to have been in Rome for some ten years by this time. • In 55 AD the apostle Paul wrote to the Christians in Rome. At the end of his epistle to the Romans he extends greetings to 27 people, but he doesn't mention Peter at all. Did he forget to greet the first bishop of Rome, thereby insulting him and likely shocking his readers? • When the apostle Paul arrived in Rome about 60 AD to have his case heard by Caesar, he asked to speak to the leaders of the local Jewish community in Rome (Acts 28:17-22). They responded: "We desire to hear from you what you think; for concerning this sect, we know that it is spoken against everywhere" (verse 22). If Peter had already been in Rome for some 20 years preaching the gospel, would the leaders of the Jewish community been unfamiliar with the teachings of "this sect?" • At about the time the apostle Paul died, Peter wrote that he was in Babylon (1 Peter 5:13). As the apostle to the circumcision, Peter was ministering to the large Jewish community in Babylon instead of being in Rome. The Bible refutes the Catholic tradition that Peter went to Rome some ten years after Jesus' crucifixion, removing one of the two pillars that supposedly prove apostolic-papal succession. Did Jesus appoint Peter as the first pope? Roman Catholic commentaries claiming that Peter was the first pope are unanimous in referring to Matthew 16:18 as proof that Jesus appointed Peter as the first pope: "And I also say to you that you are Peter, and on this rock I will build My church, and the gates of Hades shall not prevail against it." According to the Roman Catholic church, Peter is the "rock" upon which Jesus built His church. But does this verse really say that Peter was appointed as the first pope? Did Jesus institute a pyramidal structure within His church with one man at the top of the pyramid? An important principle in understanding the Bible is to view verses in their original context. The context of Jesus' statement to Peter is a question that Jesus had asked His disciples: "Who do men say that I, the Son of Man, am?" (verse 13). Jesus' disciples told Him what popular opinion was: Jesus was considered to be John the Baptist resurrected, Elijah, Jeremiah or one of the other prophets (verse 14). Then He asked them: "But who do you say that I am?" (verse 15). Peter answered Jesus' question: "You are the Christ, the Son of the living God. Jesus answered and said to him, Blessed are you, Simon Bar-Jonah, for flesh and blood has not revealed this to you, but My Father who is in heaven" (verses 16-17). Jesus then responded to Peter's confession of faith: "And I also say to you that you are Peter, and on this rock I will build My church, and the gates of Hades shall not prevail against it" (verse 18). Jesus is obviously talking about the founding of His church (ekklesia in Greek) in verse 18. But what was is it supposed to be built upon? First, we need to take a closer look at the Greek text of verse 18. God inspired the New Testament to be preserved in the Greek language. The Greek text in verse 18 uses two different words for "Peter" and "rock." "Peter is 'petros' in Greek, but rock is 'petra.' Petros means a stone or part of the rock. Petra is the rock itself. Therefore, this verse does not provide the slightest reason for the doctrine that the church is built upon Peter and that Peter is the head of the church" ("76 answers to questions on the subject of the 'assembly of God' ", No. 22, from Vorträge von H. L. Heijkoop 1968-1973, CSV-Verlag, Hückeswagen, 1975; original emphasis, our translation). Who, then, is the rock in verse 18 that Jesus will build His church upon? "Peter (Petros, masc.) was strong like a rock, but Jesus added that on this rock (petra, fem.) He would build His church. Because of this change in Greek words, many conservative scholars believe that Jesus is now building His church on Himself . . . other scholars say that the church is built on Peter's testimony ['You are the Christ, the Son of the living God']. It seems best to understand that Jesus was praising Peter for his accurate statement about Him, and was introducing His work of building the church on Himself" (The Bible Knowledge Commentary: The New Testament, John F. Walvoord and Roy B. Zuck, editors, David C. Cook, Colorado Springs, CO., 1983, p. 57; original emphasis). Some may object to this viewpoint with the argument that Jesus most likely spoke to Peter in Aramaic which does not have a similar distinction like the difference between petros and petra in Greek. The fact is, though, that the text of the New Testament was not preserved for us in Aramaic. Greek is the language that was used to preserve the inspired text of the New Testament, and the distinction between petros and petra does exist in Greek. One can imagine how Jesus might have gestured in responding to Peter: "You are Peter (pointing to Peter), and on this rock (pointing to Himself) I will build My church, and the gates of Hades shall not prevail against it." How did Peter understand what Jesus said to him? In giving account to the Sanhedrin for the healing of the lame man at the entrance to the temple, Peter emphasized the foundation of the church, Jesus Christ: "Peter, filled with the Holy Spirit, said to them, Rulers of the people and elders of Israel: If we this day are judged for a good deed done to a helpless man, by what means he has been made well, let it be known to you all, and to all the people of Israel, that by the name of Jesus Christ of Nazareth, whom you crucified, whom God raised from the dead, by Him this man stands here before you whole. "This is the stone which was rejected by you builders, which has become the chief corner­stone. Nor is there salvation in any other, for there is no other name under heaven given among men by which we must be saved" (Acts 4:8-12; unless noted otherwise, all scriptural emphasis added). "Coming to Him [Jesus] as to a living stone, rejected indeed by men, but chosen by God and precious, you also, as living stones, are being built up a spiritual house, a holy priest­hood, to offer up spiritual sacrifices acceptable to God through Jesus Christ. Therefore it is also contained in the Scripture, Behold, I lay in Zion a chief cornerstone, elect, precious, and he who believes on Him will by no means be put to shame. Therefore, to you who believe, He is precious; but to those who are disobedient, the stone which the builders rejected has become the chief cornerstone and a stone of stumbling and a rock of offense" (1 Peter 2:4-8). Nowhere does Peter ever claim that Matthew 16:18 refers to him as the head of the church, nor does he ever lay claim to this office in his dealings with the other apostles and elders. Just the opposite is true – he calls himself a fellow elder and emphasizes the need for all elders to be humble: "The elders who are among you I exhort, I who am a fellow elder and a witness of the sufferings of Christ, and also a partaker of the glory that will be revealed: Shepherd the flock of God which is among you . . . Likewise you younger people, submit yourselves to your elders. Yes, all of you be submissive to one another, and be clothed with humility, for God resists the proud, but gives grace to the humble" (1. Petrus 5:1-2, 5). Another important principle in understanding the Bible is to consider all verses on a subject instead of ignoring those passages that might not conform to one's own personal opinion. This principle helps to clarfiy whether Matthew 16:18 means that Jesus appointed Peter to be first pope. A few months after Peter's confession of faith Jesus' death was imminent. On the evening prior to His death the disciples argued over which of them was the greatest: "Now there was also a dispute among them, as to which of them should be considered the greatest. And He said to them, The kings of the Gentiles exercise lordship over them, and those who exercise authority over them are called benefactors. But not so among you; on the contrary, he who is greatest among you, let him be as the younger, and he who governs as he who serves. For who is greater, he who sits at the table, or he who serves? Is it not he who sits at the table? Yet I am among you as the One who serves" (Luke 22:24-27). Jesus compared the mentality of his disciples in arguing over greatness to that of worldly leaders who are concerned about their position and power. It follows, then, that the disciples were arguing over position. Another indication is the fact that the word in the Greek original is the same word used to describe Jesus' position vis-à-vis His heavenly father: "My Father is greater than I" (John 14:28). If Jesus had appointed Peter to be the head of the church just months earlier – in the presence of the other apostles – then why were the disciples arguing about position? It should have been clear to them who was in charge! If not, Jesus could have used the argument as an opportunity to clarify who would be the human leader of His church. We also search the New Testament in vain for other scriptures that confirm the Roman Catholic interpretation of Matthew 16:18. Instead, the New Testament refers either to Jesus or the apostles as a group in describing the foundation of the church. In comparing the work of elders to master builders, Paul identifies Jesus as the foundation of the church: "For we are God's fellow workers; you are God's field, you are God's building. According to the grace of God which was given to me, as a wise master builder I have laid the foundation, and another builds on it. But let each one take heed how he builds on it. For no other foundation can anyone lay than that which is laid, which is Jesus Christ" (1 Corinthians 3:9-11). In the same epistle Paul says that Jesus was the rock that accompanied the Israelites on their wilderness journeys: "Moreover, brethren, I do not want you to be unaware that all our fathers were under the cloud, all passed through the sea, all were baptized into Moses in the cloud and in the sea, all ate the same spiritual food, and all drank the same spiritual drink. For they drank of that spiritual Rock [petra in Greek] that followed them, and that Rock [petra in Greek] was Christ" (1 Corinthians 10:1-4). Paul also writes that Christ, the prophets and the apostles as a group – not just Peter – are the foundation of fellowship for Jewish and Gentile Christians: "Now, there­fore, you are no longer strangers and foreigners, but fellow citizens with the saints and members of the house­hold of God, having been built on the foundation of the apostles and prophets, Jesus Christ Himself being the chief cornerstone, in whom the whole building, being fitted together, grows into a holy temple in the Lord" (Ephesians 2:19-21). The book of Revelation also describes the apostles as a group being the symbolic foundation of the church: "Now the wall of the city had twelve foundations, and on them were the names of the twelve apostles of the Lamb" (Revelation 21:14). Once again, Peter is not given preeminence over the other apostles. The apostle Paul's conversion highlights God's power to influence human beings and call those whom He chooses to call. Saul was on his way to Damascus to persecute Christians when he was struck down and then baptized three days later. Jesus revealed the commission He intended the apostle Paul to fulfill: "He is a chosen vessel of Mine to bear My name before Gentiles, kings, and the children of Israel" (Acts 9:15). After being baptized Paul apparently spent three years in Arabia before returning to Jerusalem for the first time after his conversion (Galatians 1:17-18). During those three years he received personal instruction from Jesus Christ: "But I make known to you, brethren, that the gospel which was preached by me is not according to man. For I neither received it from man, nor was I taught it, but it came through the revelation of Jesus Christ" (Galatians 1:11-12). Paul's personal training by Christ was similar to that of the original apostles, who spent 3½ years with Christ during His personal ministry. When the three years in Arabia were over, Paul traveled to Jerusalem. The apostles and congregation there initially doubted his conversion: "When Saul had come to Jerusalem, he tried to join the disciples; but they were all afraid of him, and did not believe that he was a disciple" (Acts 9:26). However, Barnabas intervened on Paul's behalf. "But Barnabas took him and brought him to the apostles. And he declared to them how he had seen the Lord on the road, and that He had spoken to him, and how he had preached boldly at Damascus in the name of Jesus" (verse 27). During this visit to Jerusalem Paul met Peter and James (Galatians 1:18-19). Fourteen years after his first post-conversion visit to Jerusalem, Paul again journeyed to Jerusalem to receive confirmation for his preaching of the gospel among the Gentiles. "I went up by revelation, and communicated to them that gospel which I preach among the Gentiles, but privately to those who were of reputation, lest by any means I might run, or had run, in vain" (Galatians 2:2). Paul summarized the result of this meeting in Jerusalem: "From those who seemed to be something – whatever they were, it makes no difference to me; God shows personal favoritism to no man – for those who seemed to be something added nothing to me. But on the contrary, when they saw that the gospel for the uncircumcised had been committed to me, as the gospel for the circumcised was to Peter (for He who worked effectively in Peter for the apostleship to the circumcised also worked effectively in me toward the Gentiles), and when James, Cephas, and John, who seemed to be pillars, perceived the grace that had been given to me, they gave me and Barnabas the right hand of fellowship, that we should go to the Gentiles and they to the circumcised" (Galatians 2:6-9). Paul tells us that the office he received to preach to the Gentiles was the equivalent of the office that Peter had received to preach to the circumcision. Paul's description also shows he was unable to recognize Peter as the "chief apostle." Instead, he was one of three leading apostles whom Paul called pillars. In listing those three leading apostles, Paul did not even list Peter – "Cephas" – first: "James, Cephas and John." Paul likely had these three apostles in mind when he mentioned "the most eminent apostles" (2 Corinthians 11:13; 12:11). Over half of the book of Acts – our only biblical source for detailed early church history – is dedicated to Paul's ministry. Paul wrote 13 of the 27 books in the New Testament (14 if he was also the author of Hebrews) while Peter wrote two epistles. Paul contributed ten times more text to the New Testament than Peter. Our access to New Testament church doctrine rests largely on the foundation of Paul's writings, not Peter's. If Peter really was the chief apostle of the early church, then it is remarkable that God did not reveal to him that Paul had been converted and given a special commission by Jesus Himself. Even more remarkable is the fact that Jesus did not teach Paul about the existing structure of the church with its highest human office that Jesus supposedly had given to Peter. Jesus apparently never explained to Paul that He was building His church on Peter. The apostles and elders of the early church did not operate within a strict hierarchy. Instead, we see examples of them working together as a team. When the church in Jerusalem had grown to the point where the apostles could no longer accomplish the daily distribution of food to needy widows, they – not Peter – suggested a solution to the church. "The twelve summoned the multitude of the disciples and said, It is not desirable that we should leave the word of God and serve tables. Therefore, brethren, seek out from among you seven men of good reputation, full of the Holy Spirit and wisdom, whom we may appoint over this business; but we will give ourselves continually to prayer and to the ministry of the word. And the saying pleased the whole multitude" (Acts 6:2-5). One of the seven men chosen by the congregation, Philip, later went to Samaria and preached the gospel there: "Philip went down to the city of Samaria and preached Christ to them. And the multitudes with one accord heeded the things spoken by Philip, hearing and seeing the miracles which he did" (Acts 8:5-6). Philip was the first to preach the gospel in Samaria, so the apostles in Jerusalem sent additional support. Once again the decision was not made by Peter, but by the apostles as a team: "Now when the apostles who were at Jerusalem heard that Samaria had received the word of God, they sent Peter and John to them" (Acts 8:14). In this instance Peter was actually dispatched to Samaria by his apostle colleagues. The Jerusalem conference of 49 AD is perhaps the most interesting example of teamwork among the apostles and elders. The conference was convened to discuss the claim of some Jewish Christians that the Gentiles had to be circumcised in order to be saved: "And certain men came down from Judea [to Antioch] and taught the brethren, Unless you are circumcised according to the custom of Moses, you cannot be saved" (Acts 15:1). Paul and Barnabas debated the issue with the Jewish Christians but were unable to resolve the issue. So the church at Antioch decided to have the apostles and elders in Jerusalem hear the matter: "When Paul and Barnabas had no small dissension and dispute with them, they determined that Paul and Barnabas and certain others of them should go up to Jerusalem, to the apostles and elders, about this question" (verse 2). Note that they did not ask Peter to render a decision! When Paul and Barnabas arrived in Jerusalem, some Pharisees who had become believers repeated the demand that the Gentiles be circumcised: "Some of the sect of the Pharisees who believed rose up, saying, It is necessary to circumcise them, and to command them to keep the law of Moses. Now the apostles and elders came together to consider this matter" (verses 5-6). Peter described his experience with Cornelius and gave his opinion (verses 7-11) and Paul and Barnabas reported on their work among the Gentiles (verse 12). But it was James, the brother of the Lord and the pastor of the Jerusalem church, whose summary conclusion on circumcision was adopted by the apostles and elders. "And after they had become silent, James answered, saying, Men and brethren, listen to me . . . I judge that we should not trouble those from among the Gentiles who are turning to God" (verses 15, 19). The apostles and elders were "of one accord" in rendering the decision and communicating it to the Gentile Christians in Antioch. The consensus among the apostles mirrored their function as part of the foundation of the New Testament church (Ephesians 2:20). Wasn't Peter a leader among his peers? The apostles worked together as a team, and Peter was obviously a leader in their midst. There is little doubt that Peter's forceful personality was a strong influence among his colleagues. Peter was usually the first to take action (even if a bit rashly on occasion), to answer Christ's questions and to walk on water. It was Peter who proposed selecting a replacement for Judas, who led the preaching on the Day of Pentecost, who addressed the lame beggar and called in faith on Christ to heal him, who condemned Ananias' and Sapphira's deception and Simon the sorcerer's attempt to buy an office. "We know Simon Peter was the leader of the apostles – and not only from the fact that his name heads every list of the Twelve. We also have the explicit statement of Matthew 10:2: 'Now the names of the twelve apostles are these: first, Simon, who is called Peter.' The word translated 'first' in that verse is the Greek term protos. It doesn't refer to the first in a list; it speaks of the chief, the leader of the group. Peter's leadership is further evident in the way he normally acts as spokesman for the whole group. He is always in the foreground, taking the lead. He seems to have had a naturally dominant personality, and the Lord put it to good use among the Twelve" (Twelve Ordinary Men, John MacArthur, Nelson Books, Nashville, TN, 2002, p. 45; emphasis added). Many commentaries and dictionaries agree on Matthew 10:2 that protos here means something akin to prominent or chief, which Peter was in many respects. Jesus knew that Peter's dominant personality also provided leadership potential, which He expected him to use it in supporting his fellow apostles: "The Lord said, Simon, Simon! Indeed, Satan has asked for you, that he may sift you as wheat. But I have prayed for you, that your faith should not fail; and when you have returned to Me, strengthen your brethren" (Luke 22:31-32). "From that time Jesus began to show to His disciples that He must go to Jerusalem, and suffer many things from the elders and chief priests and scribes, and be killed, and be raised the third day. Then Peter took Him aside and began to rebuke Him, saying, Far be it from You, Lord; this shall not happen to You! But He turned and said to Peter, Get behind Me, Satan! You are an offense to Me, for you are not mindful of the things of God, but the things of men" (Matthew 16:21-23). On another occasion Peter's fallibility was evident when Paul rebuked him publicly for refusing to eat with Gentile Christians in Antioch: "Now when Peter had come to Antioch, I withstood him to his face, because he was to be blamed; for before certain men came from James, he would eat with the Gentiles; but when they came, he withdrew and separated himself, fearing those who were of the circumcision. And the rest of the Jews also played the hypocrite with him, so that even Barnabas was carried away with their hypocrisy. But when I saw that they were not straightforward about the truth of the gospel, I said to Peter before them all . . ." (Galatians 2:11-14). If Peter was the chief apostle, then it seems odd that he would be concerned about his behaviour in Antioch being reported to James. Some view Matthew 16:19 as proof that Peter was given special authority: "I [Jesus] will give you [Peter] the keys of the kingdom of heaven, and whatever you bind on earth will be bound in heaven, and whatever you loose on earth will be loosed in heaven." As The New Bible Dictionary points out, "Peter received these powers first, as he also received the pastoral commission to feed Christ's flock (Jn. 21:15), but he did so in a representative, rather than in a personal, capacity; for when the commission is repeated in Mt. 18:18, authority to exercise the ministry of reconciliation is vested in the body of disciples as a whole, and it is the faithful congregation, rather than any individual, which acts in Christ's name to open the kingdom to believers and to close it against unbelief. None the less, this authoritative function is primarily exercised by preachers of the word, and the process of sifting, of conversion and rejection, is seen at work from Peter's first sermon onward (Acts 2:37-41)" (I. Howard Marshall, editor, InterVarsity Press, 1996). The Jerusalem conference of 49 AD does not support the viewpoint that Peter was the highest authority in a pyramidal church structure. If Peter was the only one to receive authority to bind and loosen, then there would not have been any need to convene a conference to render judgment on the issue of circumcision. Peter could have decided it himself. It was also James, not Peter, who proposed the solution that was adopted by the assembled apostles and elders. Peter was the primus inter pares, the first among equals, a leader among the original apostles, but without judicial or governmental authority over his peers. He was a highly respected apostle and the holy spirit worked mightily through him. However, we find no evidence in the Bible that he was the chief apostle, nor did he ever claim that position for himself. In reviewing the position of the papacy as part of the ongoing ecumenical dialogue the Eastern Orthodox Church desires a differentiation between the first and second Christian millennia. The reason is obvious: the claim to papal authority over the entire Christian church cannot be traced back continuously to the beginning of the Christian era. The civil structure of the Roman Empire provided the pattern for the early Roman state church with its five primary sees (districts). The Roman see or district comprised the entire area of the western Roman Empire. Theologians representing the Eastern Orthodox Church readily agree that the Roman district had an "honorary primacy" or a "primacy of love" among the five districts. However, it was an "honorary primacy" in the sense of primus inter pares ("the first among equals") instead of being a primacy of high judicial or governmental rank over the other four sees. The Eastern Orthodox viewpoint concerning the early relationship among the five districts of the Roman state church is similar to the conclusions reached by knowledgeable Bible scholars concerning the relationship of Peter to his fellow apostles. "If we look into the New Testament with an open mind, we find a totally different approach to government than what has developed in the Church. This different approach affected the way the early brethren and ministers interacted with each other, and the way they handled disagreements . . . Frankly there was never – in the New Testament Church – any example of a 'Moses figure' or a 'Pope Peter' who towered over the other apostles and elders . . . You do find that Peter took the lead among the original twelve apostles and was acknowledged – although this is never directly stated – as the main speaker and leader. "For Christ used Peter to preach the main sermon on Pentecost (Acts 2), heal the crippled man outside the Temple (Acts 3), open the 'door of faith' to the Gentiles (Acts 10), etc. But you do not find him giving orders to the other apostles, sending them on missions, or in any way 'lording it over' them . . . Peter was not the Pope! He never unilaterally decided any of those basic matters in the New Testament Church!" (Church Government and Church Unity, Roderick C. Meredith, 1993, pp. 10-12). More than 100 years later, though, Pope Leo I (440-461 AD) used Matthew 16:18 to claim authority over the entire church. Using Roman law to bolster his position, he made himself legal heir to the apostle Peter. The Council of Chalcedon (451 AD) recognized Constantinople as a "see of honor" without acknowledging papal authority over the see. As a result, two years passed before Leo I accepted the Council's decrees. Leo's successors continued to claim legal jurisdiction over the entire church. Relations between Constantinople and Rome became increasingly strained, leading to the infamous schism between the eastern and western churches in 1054 AD that remains to this day. The origin of the schism is found in the different interpretations of Matthew 16:18 by the Roman Catholic and the Eastern Orthodox churches. In the sermon on the mount Jesus emphasizes an important key in evaluating situations and people: "A good tree cannot bear bad fruit, nor can a bad tree bear good fruit. Every tree that does not bear good fruit is cut down and thrown into the fire. Therefore by their fruits you will know them" (Matthew 7:18-20). What is the fruit produced by the Roman Catholic claim that the pope is the leader of the Christian church? For more than 1500 years that claim has been a source of division among professing Christians. Christians should be wary of those who cause division in their ranks, because God hates "one who sows discord among brethren" (Proverbs 6:17). They should be especially wary of those who attempt to add to scripture (Revelation 22:18) by forcing the Bible to fit their personal ideas on church government. It should be no surprise that striving for the preeminence among Christians is a source of controversy. The same thing happened when Jesus' disciples argued over greatness: "An argument broke out among the disciples as to which one of them should be thought of as the greatest" (Luke 22:24; Good News Bible). Jesus corrected His disciples by letting them know how God views greatness: "The greatest one among you must be like the youngest, and the leader must be like the servant" (verse 26; ibid.). The apostles and elders of the New Testament took Jesus' exhortation to heart. Their relationship was characterized by teamwork instead of disputes over authority. "The entire approach of the original apostles and elders was not: 'Who's in Charge here? I'd better go along or they may fire me!' Rather, the approach was – as Peter himself later wrote, 'All of you be submissive to one another, and be clothed with humility' (1 Peter 5:5)" (Meredith, op. cit., p. 12). Jesus Christ is the rock – the great immoveable foundation – upon which the true church of God is built. Those who seek to follow His example of humility and service instead of claiming to be the human leader of the church contribute to unity in the body of Christ. This article is also available as a PDF file.